LONDON: 26 FEBRUARY 2008 - Mercator Gold plc (“Mercator” or “the Company”) is pleased to present a review of its operations covering the period from 1 July 2007 to 31 December 2007 and to comment on production through to the end of January 2008.
maintained an LTI (Lost Time Injury) free record. Towards the end of January 2008 the Company started mining the Surprise ore body having completed the necessary cut-backs and waste haulage. A total of 3,980 ounces of gold were produced against a forecast of 4,000 ounces. During the month an expected positive reconciliation of the grade of the Surprise ore-body was recognised. The gold production forecast is based on a cut Au grade model for the Surprise pit; reconciliation of previous mining based on similar modelling produced higher grades than were anticipated. After approximately five months of operations at Meekatharra, the Company expects, during the period from 1 January 2008 to the end of September 2009, to produce approximately 200,000 ounces of gold. This production will come from the Surprise and Bluebird open-pits (together containing 196,000 ounces of reserves). Because of the variable grade of the Surprise ore-body, production is not constant on a month to month basis but will vary as the Company mines higher and lower grade material. The Company believes that the Surprise ore-body will perform to expectations however production is still dependant on many unpredictable factors; the most important of these are weather and plant availability. The mining industry is presently experiencing an upward pressure on costs. Mercator’s Meekatharra operations are no exception and during the six months to 31 December 2007 the cost of diesel, the single biggest cost in the operation, rose by 20%. Whilst to date the cost of production at Meekatharra is broadly in line with forecasts the Company has responded to these cost pressures by revising its life of mine cash costs for production from the Surprise and Bluebird pits. The new forecast life of mine cost will be in the order of A$570 (US$518) per ounce. Should there be increased production from the Surprise pit then the costs of production will fall to approximately A$530 (US$481) per ounce. It should be noted that the Company’s non-cash costs are very low in comparison to operations of a similar size. The Company’s only debt is a working capital line drawn down to A$6 million. The capitalised value of the Yaloginda Mill and associated infrastructure is approximately A$14m and therefore non-cash costs such as depreciation are very low. The spot price for gold in Australian Dollars is A$991 (US$900) and has in recent months been as high as A$1,050 (US$955). Mercator’s aim is to maintain production at approximately half the value of the metal contained in its ores. This will be achieved over the medium term by the mixing of ores of varying grades as the Company brings various deposits into production. To guarantee its short term cash flow the Company decided to commit over a short period of time a small proportion of its reserves. The Company sold calls over 35,000 ounces at A$906 per ounce for delivery between February and September 2008. The Company also bought puts at a similar price for a further 35,000 ounces. This strategy means that for 35,000 ounces of its near-term production the Company will receive A$906 per ounce and will receive the higher of spot price or A$906 per ounce for a further 35,000 ounces. Committed deliveries therefore stand at 7% of the total of 504,000 ounces of probable reserves. 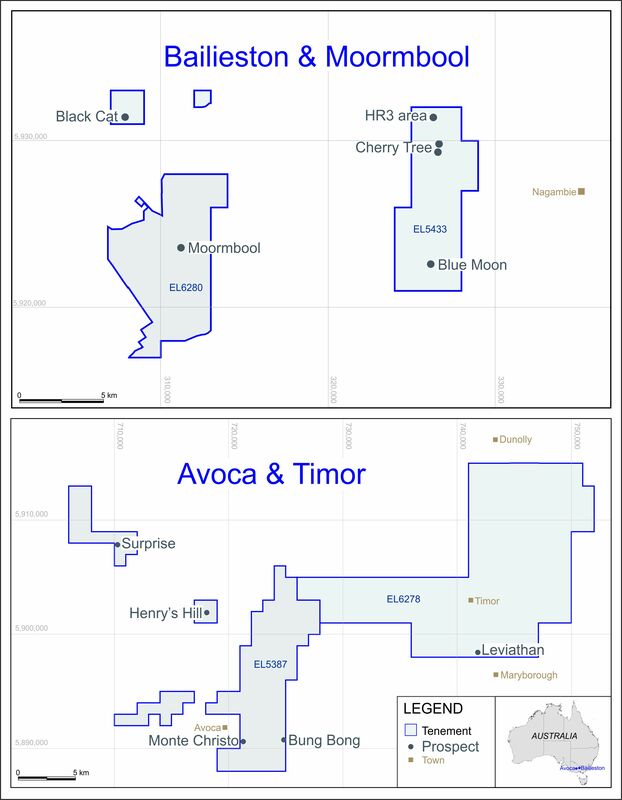 These reserves are sufficient to support a further production over a two and a half year period after the Surprise and Bluebird pits are finished. Mine planning and costing for the commencement of underground operations are underway and will be reported on separately over the ensuing months. Mr Stephen Miller of Red Rock Consulting has been appointed Project Manager for this Project. Based in Western Australia, Mr Miller is a highly respected underground mining consultant who carried out the mine design on which the Company’s underground reserves are based. The Company intends to conduct an aggressive exploration programme from underground stations to expand its resources and reserves in known areas of high grade mineralisation. The Company will lodge its Project Management Plan (PMP) to commence operations at Paddy’s Flat with the Department of Industry & Resources by the end of April 2008. The Euro Project continues to provide the Company with promising results. The project, only 6km from the Yaloginda Mill, is in deeply-weathered terrain. An eight-hole diamond drilling programme to confirm the geological interpretation has been successfully completed. *these holes were previously reported. A programme to delineate mineralisation at Fenian West is in progress. The prospect lies immediately along strike of the historic Prohibition pit and a successful exploration programme may lead to a potential open-cut option for the upper portions of the Prohibition deposit as well as adding to the Mercator resource base. One hole for metallurgical testing has been drilled at the Macquarie prospect within the Paddy’s Flat project area. The hole confirmed the existing drill intercepts and the geological model. “Our Meekatharra operation is up and running. We look forward to strong production from our open cut operations and will soon start the development of our underground reserves. The information in this report, which relates to the Surprise, Bluebird, Prohibition, and Vivian-Consols Ore Reserves, is based on information compiled by Alan Coles and Denis Geldard. Exploration results and resource information were based on information compiled by Mark Csar. A complete set of exploration results will be posted to the website. Alan Coles, Denis Geldard and Mark Csar are full time employees of Mercator Gold Australia Pty Ltd and are Members of the Australasian Institute of Mining and Metallurgy. Alan Coles, Denis Geldard and Mark Csar have sufficient experience which is relevant to the style of mineralisation and type of deposit under consideration and to the activity which they are undertaking to qualify as Competent Persons as defined in the 2004 Edition of the “Australasian Code for Reporting of Exploration Results, Mineral Resources and Ore Reserves”. Alan Coles, Denis Geldard and Mark Csar consent to the inclusion in the report of the matters based on this information in the form and context in which it appears.